The new Bias Mini Guitar (and Bass) heads will open the digital door for many new customers. Excellent amp emulations in a very portable package. No effects in the standard app. Digital amp simulations have matured at a scary speed over the past few years, and Positive Grid has underlined its reputation as one of the best with a recent new version of its mega-popular Bias Amp software. The brilliantly designed app works on iOS and Windows platforms, allowing users to build their own virtual amp from scratch as well as tapping into the thousands of ready-made patches on Positive Grid’s ToneCloud app. Bias Amp has proved so popular that some guitarists were plugging into audio interfaces and using it live. So, it was a natural step for Positive Grid to introduce its own in the shape of the Bias Head, which promises practically zero-latency operation, as well as the option of a whopping 600-watt power stage. The hardware range has also recently been expanded with the scaled-down Bias Mini, offering dedicated versions for guitar and bass and a 300-watt power stage. The Mini is exquisitely designed and assembled; the internals are PCB-based and unsurprisingly look more like a computer than a guitar amp. 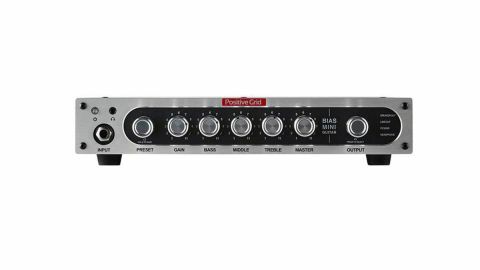 Despite being much smaller than the recently-reviewed Bias head, the half rack-sized Bias Mini manages to keep most of the essential rear panel functionality, while front panel controls stick to the essential amp type, gain, tone and volume, with a clever output level knob governing separate levels for line-out, speaker, headphones and FX send. As the head features a purpose-built interface for the Bias Amp software, you’d expect integration to be faultless, and for the most part it is. Online activation and registration is fairly straightforward, with both amps hooking up to an iPad without any problems. PC owners may need some updates; Bias Amp worked fine with a modern Windows 10 laptop, but failed to run on an older Windows 7 machine, so check out forum posts on compatibility. The app itself is superb, with beautifully drawn artwork adding to the illusion that you’re customising real amps, rather than shuffling ‘0’s and ‘1’s inside a DSP. Effects are noticeably absent, however, but there’s a noise gate, hum reduction and several excellent reverbs, with a choice of room, plate and hall algorithms alongside a superb chamber. Upgrade from the standard app and you can access a very tempting Celestion-licensed cab module and load your choice of IR patches, as well as play with the Amp Match function. Saving presets is quite straightforward - once you’re happy with a particular sound, click on ‘Save to Head/Rack’ in the preset menu and you’re good to go. The Bias Mini allows real-time tweaking from the front panel controls like any regular guitar amp. It has 16 presets, arranged in two banks of eight called Red and Green. Turning the preset knob selects the patch, while tapping it swaps from Red to Green and back again. The overall quality of the presets is excellent; your idea of what constitutes a perfect AC30 or tweed Bassman may not always line up with other people’s, but there’s plenty of flexibility in the software to deal with that. What’s more important is that the core tones are very usable for both live and recording situations, with plenty of instant-gratification patches in the ToneCloud for those occasions when time is in short supply. The higher-gain distortions keep noise down to respectably low levels, helped by the noise gate. We’re also very impressed with the lower gain voicings, particularly the glassy treble complexity of the ‘ ’64 British J45’ patch and the touch-sensitive midrange throatiness of ‘Tweed Lux’. The coolest part of the head, though, is the way it quickly interfaces with desks to provide that same quality direct to a house PA or a recording track. While effects have to be added separately, the built-in reverbs provide all the ambience you need for exceptional realism; the rooms, halls and plates are all very adaptable, while the chamber emulation is one of the best we’ve heard and essential for recreating the vibe of early guitar sounds from both sides of the Atlantic. It also has volume to spare for any size gig. Whatever your opinion of digital modelling, products such as the Bias Mini definitely have their place, now and in the future, making it easy to get consistently great sounds on stage and in the studio, while bypassing the tedium of tweaking EQs and mic positioning. The playing experience comes very close to the real thing, convincingly replicating the response and dynamics of a real valve circuit. The new Bias Mini Guitar (and Bass) heads will open the digital door for many new customers - they’re more accessible and compact, making for a powerful and portable tool, ideal for small to medium-sized gigs. If you’re thinking of going digital, there’s never been a better time to think Positive.